Are you interested in a career protecting computer networks from cyber-attack or being part of operations to crack hostile computer systems? A skilled cyber warrior has quickly become a stock character of television series and movies. Defending computer systems from attack and designing counterattacks is not only an intriguing fantasy adventure, but it is also a career path in the Air Force. 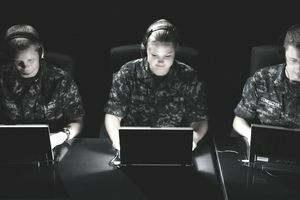 The career field in cyber warfare operations is open to enlisted military Airmen who already possess skills in computer networks. A minimum score of 60 on the Air Force Electronic Data Processing Test is needed for entry to this career field. Personnel in the Cyber Warfare Operations specialty perform duties to develop, sustain, and enhance cyberspace capabilities. These capabilities are used to defend national interests from attack and to create effects in cyberspace to achieve national objectives. Cyber Warfare Operations Apprentice 1B431: Awarded after completing 1B4X1 Cyber Warfare Operations Initial Skills Course. Apprentices are assigned into positions such as incident response operator or interactive operator. The technical school takes 16 months on average. Cyber Warfare Operations Journeyman 1B451: Awarded after completing 1B451 CDC and other requirements. Cyber Warfare Operations Craftsman 1B471: Minimum rank SSgt. Cyber Warfare Operations Superintendent 1B491: Minimum rank SMSgt. As a part of cyberspace warfare operations, personnel in this career field work with surveillance, combat, reporting and network management systems. Operations work to protect data and network systems in ways beyond passive defense measures such as firewalls. Some operations are in support of intelligence operations. You must be able to interpret directives into specific guidance and procedures for operator actions and develop and execute operation plans. You will evaluate the operational readiness of communications, sensors, intrusion detection, and related support equipment. You will coordinate with other operators performing weapons control, surveillance, and network activities. Your duties can include advising the commander on the readiness of capabilities, status reports, training exercises, and evaluation results. Knowledge: This field requires knowledge of computer operating systems, hardware, software, databases, and programming languages. It is essential to understand networking fundamentals, protocols, network addressing and infrastructure, telecommunications theory, and data communications. You must be proficient on wireless networking as well as delivery to personal wireless devices and understand cryptography, including utilization and exploitation techniques. You must understand cyber operation laws. Education: Must have completed high school. Additional courses in STEM (science, technology, engineering, and mathematics) are desirable. It is also desirable to have an Associate degree or higher in related fields or Information Technology (IT) certification. Training: For an award of AFSC 1B431, completion of Cyber Warfare Operations Apprentice course is required. Experience. No experience is required for the Apprentice level. Other: Eligibility for a Top Secret security clearance according to AFI 31-501, Personnel Security Program Management. Award of the 3-skill level without a final Top Secret (TS) clearance is authorized provided an interim TS has been granted according to AFI 31-501. Source: AFSC 1B4X1 Cyber Warfare Operations Career Field Education and Training Plan, November 2014.